But, despite keenly orchestrated leftwing panic-mongering, we shouldn’t have been so shocked. We had already been slapped before with Kerry’s every single earth-shaking admonition. Last November 6, for instance, Kerry was interviewed jointly by Israel’s Channel-2 and Palestinian TV. What he said then wasn’t meant as a private off-the-record caution. It was literally broadcast for all to hear and be awed. Just as now, Kerry then too depicted Israel as obstructionist and obdurate. Without much ado, he imparted the message that Israeli intransigence is the one outstanding obstacle to global peace and prosperity. If his pet project – the so-called peace talks – fails, it will be our fault and we will reap the whirlwind. We will only have ourselves to blame for the calamities we bring on ourselves. Bottom line, if Israel doesn’t tamely toe the Obama-Kerry line, it will deserve whatever punishment is meted out to it – either via the ostracism of the otherwise loving family of nations or via more carnage in a new terror campaign, which has been a priori justified by the American president and his secretary of state. There’s not a whit of difference – not even in microscopic nuance – between Kerry’s November and February intimidations. His vocabulary choices may naturally vary and his grammatical constructions may be differently awkward, but it’s the same attempt to scare us and reiterate that the current American Administration means business – at Israel’s expense. And since the entire Arab/Muslim world was then and is now tuned in, we may be forgiven for wondering just what effect Kerry’s endorsement of the “Palestinian narrative” might have on Ramallah’s purported peace negotiators. Will they discern in Kerry’s bitter scolding of Israel an incentive to greater flexibility on their part? Or will Kerry’s espousal of their propaganda slogans embolden Ramallah’s honchos to remain every bit as emphatically inflexible as they had been hitherto? Kerry’s support for Ramallah’s continuous and extreme uncompromising stance is moreover colossally paralleled by the spectacle of appeasing Tehran’s nuke-craving regime. Can anyone rationally expect that Iran’s fanatics would be more forthcoming after sanctions were eased and pressure on the ayatollahs has been alleviated? The chances of that happening are just as promising as were the chances that after the infamous deal contracted at Munich, Hitler would be sated merely with swallowing up the Sudetenland. Chamberlain and his foreign secretary Lord Halifax may have been naïve when they sacrificed Czechoslovakia but the Obama/Kerry duo has no similar excuse to blunder. Having messed up nearly every country in the Mideast, they appear determined to add Israel to their list of victims. After so many botches in one volatile region it becomes increasingly hard to chalk all this up to stupidity. Charitable as we may be, we cannot but ascribe their policy to persistent ill-will – and that’s putting it exceedingly mildly. It’s impossible to avoid the impression that Obama helped America’s enemies and betrayed its friends. This is consistent. In country after country, his meddling resulted in destabilization followed by anarchy. Erratic as the Arab/Muslim realm has always been, it had plainly never witnessed anything like its Obama-inspired mayhem. A quick glimpse at Iraq is enlightening. Its ongoing agony constitutes gory testament to America’s failure to finish what it starts. During the past year an average of 70 bombs went off there each month and the toll in human life has lately approached a thousand a month. That, of course, pales in comparison to Syria but why quibble? Obama has made commitments he can’t keep regarding every country in the Mideast. Now he promises Israel syrupy bliss if we only do as he imperiously dictates. Yet why should we trust that our fate would be brighter than that of the Iraqis? In all probability, our plight would actually be incomparably more acute considering that our incredibly narrow country is a mere nine miles wide at its center. It is, furthermore, surrounded by enemies with unconcealed genocidal intent. The Iraqi bloodletting would likely be a trifle scrape in contrast to what awaits us, should we yield to Washington’s ultimatum. Our existential misfortune obviously would be no skin off Obama’s and Kerry’s noses and in the short haul it would surely confer upon them honors and accolades aplenty. This must partly account for why the two cannot abide the relative calm in this country and its immediate vicinity (like Jordan, which is protected by Israel). True to their abysmal record so far, they insist on ushering havoc into our midst as well. That’s why Kerry in so many words invited terror and sanctions against uncooperative Israel. To hear him, only Israel is guilty. His solution is simple – Israel must pay. It must pay everything, upfront and in full. No demands are made of Mahmoud Abbas’s Palestinian Authority. There’s never a hint of censure against Abbas. Even the hyped American principles of boosting democracy are set aside for his sake. Abbas is now into his tenth year in office as so-called president, although he was last elected (in so-called elections) to a four-year term on January 9, 2005. Besides not speaking for Gaza, he doesn’t even represent Ramallah. Consequently, even if Abbas were as sincere as a saint, he couldn’t honor his commitments – and this Holocaust-denier and terror-glorifier is hardly a saint. It’s into his hands that Obama/Kerry would have us entrust our future and that of our children. An epic victory bash would doubtless be thrown in Washington if Obama/Kerry coerce Binyamin Netanyahu to cravenly capitulate to the deal they impose. But perhaps the much ballyhooed quest for coexistence is just fancy window-dressing. Perhaps the Obama/Kerry pair isn’t even after a lasting peace. Odds are they’d make do with knocking Netanyahu’s coalition off balance. Their animus towards him is no secret. If they can set the cat among the pigeons, they’ll have come out ahead no matter what. If they trigger Tzipi Livni’s and/or Ya’ir Lapid’s walkout, the coalition collapses. If they get the Bayit Yehudi and likeminded Likud members to bolt, Netanyahu would be just as unable to continue in office. Obama’s slights against Israel’s prime minister are legend. The one in which Obama abandoned his White House guest Netanyahu and went “to have dinner,” has never been surpassed for breaches of protocol and common courtesy. The president who bowed before the Saudi potentate finds Israel’s democratically elected leader utter anathema. Obama’s misadventure with an open microphone at the November 2011 G20 summit in Cannes provided us with direct unfiltered substantiation of his bias. It happened when he chitchatted chummily with French then-President Nicolas Sarkozy. “I can’t stand him. 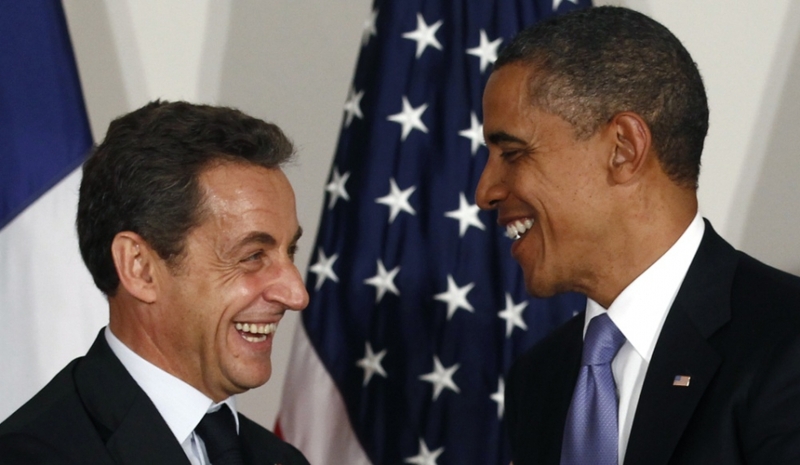 He’s a liar,” a chagrined Sarkozy blurted in reference to Netanyahu, the man both of them love to loath. (Sarkozy’s feathers were apparently ruffled because Bibi didn’t credit him with Gilad Schalit’s release). We must obviously bear in mind that what we overhear by coincidence is surely only a negligible fragment of worse utterances to which we never become privy. Obama’s careless prattle in the vicinity of plugged-in sound equipment offers but an infinitesimal indication of what’s said out of our earshot. Besides, the aforementioned hostility was exposed during Obama’s first term. Israelis have every reason to be ultra-leery of second-term Obama, well after he had waged his last campaign and has become invulnerable to voter backlash. I spite of this belligerent person who is really doing the bidding for his boss. I strongly believe that in the end Israel will not surrender anything to satisfy the White House Blood lust for Israel. Everything this administration does turns to crap. The American Jewish community has been silent up till now, but remember there are a lot of Jews in the Democratic Party, and not all are ambivalent to Israel’s plight. My take is that Kerry will be applying the pressure on Israel because he really has nothing to offer to either side. These TransJordan Transplants are not budging and based on the the EU and Obama support why would they. In the end Israel will holds it ground and in my opinion start to muster the American Jewish community against this distress American administration. I do not see anything coming out of here and if the EU wants to boycott Israel let them, because the Iranians have seemed to manage quite well in spite of the global boycott. This Obama Administration is all talk, smoke and mirrors and in the end a collective hollow suit. Israel must stand it’s ground on all defence matters by simply pointing out to the current situation in Gaza. If kerry really had something to say, he would have said or don it. Kerry and Obama have nothing now and nothing tomorrow. I agree with your Sarah and hopefully have nothing to lose if we say no – but what worries me is whether the left wing liberal democrat types within Israel see (arguably self appointed and self serving 5th columnists) life in the same way and agree with your sentiments. There seems to be a class of university educated educators who appear to live in “la la” land who want to embrace Israel’s detractors and sing ‘Kumbaya” , and volubly denounce Israel at every opportunity . No individual with a sound mind would be foolish enough to disagree with a single point made here by the inimitable and ever wise Sarah Honig. Jews have faced one epic existential disaster after another throughout their long history. But the present threatening disaster was ironically partially initiated by the considerable support that the Democratic Party received from Jewish voters in the past two Presidential Elections. The abandonment of the Jews is nothing new, of course. The United States government knew that the Jews of Europe were being slaughtered in massive numbers as early as 1941 if not much earlier, and yet turned a blind eye to the situation. Indeed, the excuses often made that the US and Britain were unable to slow the slaughter were proven long ago to be ignominious lies by a roomful of large Black and White WW II allied fighter bomber surveillance photos that anyone can gaze upon at Yad Vashem. The photos give the lie to the WW II statements by the allies that their planes were not able to carry enough fuel to reach the worst of the Death Camps and interrupt the non stop slaughter by bombing the German rail lines that carried the victims to their doom as well as destroy the Gas chambers and the Crematoriums. These fighter bombers all carried sophisticated high tech cameras with powerful telephoto lenses to record the daily record of their bombing runs. A standard air force procedure. There are photographs where one can actually see in detail the long lines of doomed Jews as they were being herded into the Gas Chambers. These photos are a chilling reminder that the world will take the trouble to document the deaths of Jews but not raise a finger to stop their deaths. If someone had written and described, even a few short years ago the policies we are presently witnessing in Washington, that person would have been looked upon as a raving lunatic. A US betrayal of the State of Israel ?? Impossible- not to be imagined. America is Israel’s loyal friend and staunch protector ! Have you ever watched the Sun set in the Western sky? It all happens so slowly, so gradually, that the entire process is almost imperceptible. One can hardly detect the actual subtle process by which the sky grows darker and darker. And then suddenly the world is engulfed in total darkness. This is what happened to the Six Million Jews during the Holocaust. They were not able to see, to comprehend, the big picture until it was far too late to have any influence on their intended Fate. Not that they had much power or influence in the first place. But what we are witnessing right now is something new. Only a fool would not see that. Clearly this present US Administration has goals and priorities on the world stage that have nothing, zero, to do with what is in the best interest of Israel- or even Israel’s very survival. Israel was always a part of America’s global Cold War Strategy. The Soviet Union had it’s proxies in the Middle East and America thus needed its own “proxy”. A safe and trusted base of operations should that ever be necessary. The State of Israel was something to be “used”. Just as the C.I.A. clandestinely assisted Tibet when it was brutally invaded by China and over a million Tibetans lost their lives. But when it was later decided by Nixon and Kissinger to broach a “détente” with China, then Tibet was abandoned to its fate. But clearly we now are witnessing a new take on the Middle East as far as Washington is concerned. Israel will be pressured and “used” by the present Administration in Washington as Washington sees fit. No sane or even remotely realistic and informed person can possibly think and believe that all the problems of the Middle East can be laid solely at the feet of the Palestinian/Israeli conflict/s. And the US is well aware of that fact. But if Kerry and his “boss” can pull off some type of imaginary/mythical “settlement”, however illusory and short lived- they could not care less. And when it all quickly unraveled and new Mid East wars erupted between Israel and its enemies, Washington would simply insist it had “done its part” to solve all the age old dilemmas and that Israel must fight its own battles. The truth is that the State of Israel is well prepared for any and ALL eventualities. Even in a worst case scenario, The State of Israel will survive, albeit battered and bruised and with great, even horrifying cost to human life as it has always done since its birth in 1948. Its future attackers will not fare nearly as well. But is breaks the human heart to see how nothing has changed in two thousand years. The Jews of the world have always been the world’s Eternal Scapegoat and have always been considered expendable. Even and especially, by their so-called “Friends”. Very sadly dear Sarah, I fear for our PM’s life if he is thought of as “standing up” too much to these two arch criminals, and especially that rotten Obama who sneaked in through the back door to usurp the American presidency. The US has twisted Israel’s arm many times in the past but the arrogance of this administration is astounding. Never has an American administration slighted and insulted Israel to the degree the obama admin has. Past administrations have supported Israel with a mixture of strategic plotting ,and what I believe to be a somewhat luke warm affection for Israel, but none have ever exhibited the antipathy, animosity and shear contempt for Israel, her leaders and the people this administration has. And of course, carry a big stick. Here stateside, it’s hard to distinguish those who don’t know any better among American Jews who back Obama and Kerry from those who might have it in for Israel, since all assert they are acting out of love and concern. photo-ops, chaired by J-Street’s national director Jeremy Ben-Ami, joined by MK Amram Mitzna, the main speaker, in support of the Obama-Kerry peace process push and pressure. It was a very large turnout, nearly full capacity, good-natured, well-meaning and, alas, mostly in fervent accord with the program, but Mitzna’s “painful concessions” rang hollow next to the soft laughs and knowing snickers once jibes about “settlers” were voiced. Yes Sarah, Israel has NOTHING to lose by saying “no” !!! Obama and Kerry are Israels enemies and Israel can only ***WIN*** by refusing their MOST ILLEGITIMATE demands. The best way to play this fools game is, to make nice and to do NOTHING ! Just wait them out until the US midterm elections in November…two years later Kerry & Obama will be history and Israel will have finally prevailed. Then the earth will have moved in favor of Israel ! Israel MUST WAKE UP NOW !…the complete diplomatic defeat of Kerry & Obama is, aside from defeating Irans nuke program, the most defining moment in the history of Israel since the Yom Kippur war. IT MUST BE DONE AND WON ! What hurts the Pal Arabs is the ‘colonisation’ of ‘their’ land by Jews. Their crying resonates with Western liberals, and threats and warnings from the likes of Kerry, Hague and Ashton is evidence of that. If Israel stops building or even quits the land the Arabs will treat that as weakness and be encouraged to pursue their ambition of destroying her. If Israel persists with building it informs the Pal Arabs that their failure to make peace implies the loss of ever more land. Building will not bring peace because no amount of pain is greater than the idea of destroying Israel, but stopping will be worse. Apparently the “legacy” Obama and Kerry want to leave the Middle East is to put it on ice by creating the same sort of “glorious” equilibrium that Europe “enjoyed” during the heights of the Victorian age and is appallingly ironic when you consider that all Western Leftist foreign policy is based on despising that era. Which will in turn allow the next, in most probabilities, Democratic administration to implement the Asian “pivot” that he’s long fantasised about,while kicking the Middle East down the road with an ever expanding gun powder magazine just waiting to truly go off. Dear Sarah, why oh why dont others see this as black and white as you do, and as many of us outsiders can see it for what it really is? thank you for your piece, again, its really great to read how you write, but the content is somewhat chilling…when will too late be too late for Israel? it cant be far away…its obvious that this US administration are not G-d fearing people. And one cant help but feel that the old adage applies very well here… with friends like these….? You are nice people, a soft target, there are no repercussions to bullying you, no fatwas, no bullets. Your words mean zilch to him. He will continue to bully you because he can. Putting pressure on the Arabs, on the other hand, could have bad consequences. Obama has mediocre interpretative standards. His contrived contempt for Netanyahu was totally out of order – I am not saying saying I am aginst his politics but he puts brown sauce on his breakfast.